“Every hour, all over the globe, an infinite number of memories disappear, whole glowing atlases dragged into graves. But during that same hour children are moving about, surveying territory that seems to them entirely new. They push back the darkness; they scatter memories behind them like bread crumbs. The world is remade.”No surprise that the stories in Memory Wall all focus on memory, attempts to retrieve it and loss. The three most successful stories (Memory Wall, Village 113 and Afterworld) all feature old women on the verge of losing their memory. Memory Wall itself flutters playfully towards sci-fi. Alma, to combat encroaching dementia, has had many of her memories downloaded onto cartridges ( yeah, you have to huff and puff a bit here to suspend disbelief ) that line the wall of a spare room in her house. One of these cartridges contains the memory of the day her husband Harold, a fossil fanatic, discovered an intact dinosaur skeleton out in the desert before succumbing to a heart attack. Two street urchins, one of whom is a “memory-tapper” (he’s had the same operation as Alma) enter her house every night searching for this cartridge. It’s a wacky brilliant story teeming with Doerr’s fabulous stylised lyrical prose and his offsetting of intimate human moments with the eternal impersonal rhythms of the natural world. The real stunner though is the last story, Afterworld. This reads like an inspired trial run for All the Light We Cannot See. Afterworld tells the story of Esther, a German Jewess who suffers from epilepsy and grows up in a Hamburg orphanage during the years of Nazism. She is the only girl in the orphanage to escape deportation and grows up to become a celebrated illustrator of children’s books. The writing throughout is utterly gorgeous. Like many books of short stories Memory Wall contains the brilliant, the good and average. Village 113 was good. The River Nemunas read like Doerr had just read all of Nichole Krauss and Jonathan Safran Foer’s books and had a bash at writing fan fiction. Procreate Generate was okay and I can’t now remember a thing about The Demilitarised Zone. Worth buying though for Memory Wall itself and Afterworld. Tony Doerr knocks it out of the park with this one. His writing is achingly beautiful, at every level. Doerr chooses the perfect words, crafts sentences that make your heart feel too big for your chest, and repeatedly surprises--repeatedly offers up the thing that's both unexpected and exactly right. The stories are magical in that they each contain something not-quite-of-this world: a memory machine, an epileptic ability to connect across time and space, an impossible sturgeon. It's not flying-monkeys magic, or blood-sucking immortality magic, or any kind of unbelievably supernatural or material witchcraft. No, the magic in these stories is accessible; it feels possible, somehow. It's the kind of magic we all already sort of believe in. Or want to.And Doerr uses it to elevate the questions he's grappling with here: what we make of memory, and what it makes of us, the nature of love and longing, of connection, between human beings. This is an amazing, beautiful book. BABTListen hereJust 'Afterworld' from this collection.Description: Esther, who is an epileptic, escaped Nazi Germany when she was a child and has lived contentedly in Ohio with her husband and their son. Now 85, her fits have intensified and she is haunted by visions of her childhood friends from the orphanage she grew up in. They appear to be calling to her, as memories from her past flood in. Anthony Doerr is an American author of novels and short stories. He gained widespread recognition for his 2014 novel All The Light We Cannot See which won the Pulitzer Prize for fiction. Afterworld is taken from Memory Wall, a collection of stories about memory.Episode 1: Esther's seizures open up a new world where old friends await.Episode 2: Esther was ten when change came with the arrival of an emigration letter.Episode 3: Miriam calls to Esther through a microphone.Episode 4: Esther tells her grandson Robert about the girls from the orphanage.Episode 5: Miriam's voice is getting stronger. This is my first experience reading Anthony Doerr, but it will not be the last. I loved reading these stories. My reactions varied throughout from frustration to sadness to happiness to occasional fleeting moments of joy as I watched these people struggling with momentous choices or small, repeating incidents building in their lives. The concept of memory and it's place in our everyday lives is used from many different angles, effectively from my view. To say much more would be to try to summarize the stories themselves which I really don't want to do. That's better left to a reader or to reading the summary on a book jacket. I want to marry Anthony Doerr. Oh, wait, I'm already married. Then I'll have to do the next best thing: read everything else he's written, because I love the company of his mind, love traveling through his continents, inspecting with his creations the symbols and shards of memory that form a life and its contingencies. Doerr's tight writing paradoxically evokes whole worlds of culture, time, history, and real, breathing characters. We go to Africa, Lithuania, Germany, Wyoming, China in this collection of stories, each a strange world unto itself. "Now my husband," Alma says suddenly, not quite speaking to Pheko but to the kitchen at large, 'his passion was always rocks. Rocks and the dead things in them.'" Without saying she has Alzheimer's we suffer the same conflation of sense perceptions; we climb into a deteriorating brain that has moments of clarity but can't stay organized. "'To say a person is a happy person or an unhappy person is ridiculous. We are a thousand different kinds of people every hour.' She looks at Pheko then, though not quite directly at him. As if a guest floats behind him and to his left. Fog seeps through the garden. The trees disappear. The lounge chairs disappear. "'Don't you think?'" Doerr takes a character like this, then, and subjects her to multiple house-break-ins, as thugs search her home each night for one of her late husband's important finds. She knows something is wrong but can't quite place it or remember each night and its violence-seething thievery, and this set up gives us a strange mix of poignancy and tension. You don't know where Doerr will take you, but you want to go, and you strongly suspect that it's the characters themselves, not Doerr, doing all the driving. I am a huge fan of The Shell Collector, so was a bit worried when I started reading this collection. The first story takes a rather dystopian view, writing I don't usually warm up to. However, I soon realized that Doerr has chosen to go in a different direction than those stories of his past. He challenged himself, and more than rose to the occasion. I have never read writing quite like this, especially in two of the stories, Memory Wall and Afterworld. And when I was taken abruptly out of these lyrical worlds into the more realistic one in The River Nemunas, I almost balked. However, this story drew me in as well, and ended up portraying one of the most touching relationships in the book, between an orphan and a woman in the last stages of senility and life. What a gift, to be able to imagine so many different worlds, in different styles and language. Simply, a brilliant mind exploring every reach of the human mind with scientific wonder and tenderness.A must read for fans of literary fiction. Aldous Huxley once famously said, “Every man’s memory is his private literature.” In this luminous collection of short stories (including an 83 page novella), Anthony Doerr probes the fragility and endurance of memory, in locales that vary from South Africa to Hamburg…from Lithuania to Wyoming…and from the heinousness of the Holocaust to an immediate dystopian future.This masterful collection is bookmarked by an opening and an ending story with two diverse elderly women as key protagonists. The title story, Memory Wall, presents the elderly Alma, who lives in South Africa where she undergoes periodic “harvesting” of memories, stored on a series of numbered cartridges. By “hooking herself up”, she is able to recreate experiences to stave off her worsening dementia. She falls victim to a criminal and his accomplice “memory hunter” who attempt to rummage through these cartridges to find the location of a rare and lucrative gorgon fossil – one that will be the ticket to the good life that has been denied them. The young accomplish muses, ”Dr. Amnesty’s cartridges, the South African Museum, Harold’s fossils, Chefe Carpenter’s collection, Alma’s memory wall – weren’t they all ways of trying to defy erasure? What is memory anyway? How can it be such a frail, perishable thing?”The ending story also focuses on an elderly woman – in this case, Esther, an orphan and an epileptic, who was spared the fate of her many close friends in Birkenau. Now in her early 80s and living in suburban Cleveland, her seizures are getting worse and she returns again and again in her mind to poignant, nightmarish memories of her times in ravaged Hamburg, as she relives her survivors guilt. As he watches her deterioration, her grandson Robert reflects, “Every hour…all over the globe, an infinite number of memories disappear, whole glowing atlases dragged into graves. But during the same hour, children are moving about, surveying territory that to them is totally new.”As in most short story collections, each reader will likely have his or her favorites. One of mine is the fable-like Village 113; the Three Gorges Dam is about to be built, submerging a village and forcing its inhabitants to relocate. The tale is relayed by seed keeper, whose engineer son is spearheading the project. Doerr writes, “Memory is a house with ten thousand rooms; it is a village slated to be inundated.” The seed keeper and the schoolteacher are quite literally drowning in memories.Each of Anthony Doerr's well-crafted stories focuses on the most important things in life: birth, death, survival, solace, but most of all the memories. Podcasts have really been influencing my reading lately. This is the second book I went looking for after the "Forbidden Crushes" episode of Dear Sugar Radio (the first was Wedlocked: A Memoir by Jay Ponteri.) This collection of stories had nothing to do with the topic of forbidden crushes, but was mentioned in passing. Most people know Doerr from his Pulitzer Prize winning novel, All the Light We Cannot See, but he had published a few books prior to that success. I was unfamiliar with his previous works and decided to read these stories. Memory WallThe title story, this is more of a novella, about a woman who has been undergoing treatment for memory loss. She is an elderly white South African who grew up during apartheid. A thief has employed an orphan to steal her memories to try to find the fossil her husband discovered the day he died of a heart attack. Set in the near future and moving rapidly between points of view and memories, the story is sad in many ways.Procreate, GenerateA detailed look at a couple as they try everything to conceive, where suddenly bodies become more like machines. The Demilitarized ZoneTold partially through letters from Korea to a parent, this one was less successful to me.Village 113My absolutely favorite story, about a seed keeper living in a Chinese village that is about to be submerged because of a dam. The writing is beautiful, the characters are unique, and I will remember this one.The River NemunasAfter both her parents die of cancer in the span of a few months, a young girl moves to Lithuania to live with her grandfather. Memory, grief,life.AfterworldEsther is close to the end of her life, and seizures transport her to a parallel world where the children she lived with in an orphanage are waiting for her. As a child, the seizures helped her understand she needed to wait until everyone she knew was dead.... this one was a wee bit confusing but I can see his spark of interest in World War II that was more fully developed in All the Light We Cannot See. "Memory Wall" - the first story really knocked my socks off. This is set in South Africa during a time when doctors can implant a device in your head to help combat dementia. There is a lot to this story, but I don't want to give it all away. "Procreate, Generate" - a couple struggles with the stress of infertility. "The Demilitarized Zone" - a divorced couple corresponds with their son who is away at war. "Village 113" - an entire village is about to be flooded out for the advancement of civilization. The engineer making it happen returns home and attempts to talk his mother out of leaving. "The River Nemunas" - Allison is fifteen when both her parents die. She is sent to Lithuania to live with her maternal grandfather. This is her story of grieving. "Afterworld" - this a story about Esther - in her eighties and when she is a girl - and it is so sad and heartbreaking. But, Doerr handles the subject matter with grace. Wow. I am so glad I found my way to Doerr. I think he may be my favorite writer. He has such a gift with words. When I am reading his books, I feel completely transported to whatever world he is creating. Phenomenal. Phenomenal. Still reeling from its awesomeness. When I finished this book, I remained stuck in a sort of trance state, sitting in my living room, but traveling through the worlds that Doerr created. I even lived through a particularly crowded and harrowing commute home without even flinching because I was so rapt by this book. This collection of short stories was so vivid - the last one especially. Without giving too much away, its exploration of epilepsy and memories, practically time travel, made me think back to "The Spirit Catches You and You Fall Down," and how disabilities might be conceived as gifts. I've been thinking about the themes and characters in this book for weeks now and simply cannot write a review that does it justice. If you're like me, this book will cause you to reflect on what memories mean, what gives our lives meaning, and how a great story can leave an imprint on your heart. Cheesy, I know, but I'm serious. Every now and then I find a piece of literature that proves that a certain alignment of letters on a page can totally surpass being classified as 'language' and express the deepest echoes of the human heart. This miracle of storytelling happened for me a couple of times in this book. Where you simply have to stop, close your eyes, and literally feel the pull of the words as they pluck your individual heart strings. This is a collection of short stories. Varying tales of love and loss, and the fragility of the memories we retain, and rebuild, of both. With the first and last stories most definitely worthy of 6 stars the whole book easily earns 5 of them from me. The first story Memory Wall, presents an extremely original concept, where memories are retained on 'cartridges' so they can be veiwed later. Doerr took my breath away with these two paragraphs, that prefectly describe the effects of dementia..... 'Each cartridge on Alma's wall becomes a little brazier, burning in the darkness. Luvo wanders between them, gradually exploring the labyrinth of her history. Maybe, he thinks, at the beginning, before the disease had done its worst, the wall offered Alma a measure of control over what was happening to her. Maybe she could hang a cartridge on a nail and find it a day or two later and feel her brain successfully recall the same memory again - a new pathway forged through the dustlight.When it worked, it must have been like descending into a pitch-black cellar fora jar of preserves, and finding the jar waiting there - cool and heavy, so she bring it up the bowed and dusty stairs into the light of hte kitchen. For a while it must have worked for Alma, anyway; it must have helped her believe she could fend off her inevitable erasure. 'Seriously, ... her inevitable erasure... can words more exquisitely paint the slow erosion of memory?And in the final story, a grandson remembers his beloved Grandmother, and beautifully ponders the dual directionality of life .... 'We return to the places we're from; we trample faded corners and pencil in new lines. "You've grown up so fast," Robert's mother tells him at breakfast, "look at you". But she's wrong, thinks Robert. You bury your childhood here and there. It waits for you, all your life, to come abck and dig it up. 'Doerr is a writing I will be keeping on the top of my list, and I can't wait to get my hands on his other books. He most certainly has the skill to turn a great craft into a work of art. My only complaint with this book is that it came to an end. Memory Wall - Doerr audio performance by multiple narrators 5 starsAnthony Doerr published four books before the phenomenally successful All the Light We Cannot See; one novel, one memoir, and two collections of short stories. Memory Wall is the collection that was published in 2010. There are six stories in this book. Not one of the six is even mildly disappointing. The stories differ in characters and setting. Memory Wall, the title story, is a about an elderly, white, dementia patient and takes place in South Africa. It is speculative,science fiction that proposes a chilling ‘what if’ scenario in memory reclamation. Procreate, Generate and The Demilitarized Zone are contemporary fiction set in middle America. Village 113 chronicles China’s Three Gorges Dam construction through the eyes of a village ‘seed keeper’.The River Nemunas sends an orphaned American teenager to live with her Lithuanian grandfather. In the last story, Afterworld, an elderly Holocaust survivor spends her last days with her grandson while having seizure induced visitations with her lost childhood friends.Each of these stories explores an aspect of memory, but they are not linked to each other in any other way. Each setting is distinct, with great attention paid to the flora and fauna of the natural world. Doerr’s prose is lyrical and haunting. The characters are real enough to walk off the pages. The audio production used different performers for each story. Lisette Lecat was perfect for the South African Story. All of the stories were well read. Although, despite the Chinese surname, Louis Changchien read as if Three Gorges Dam was located in the middle of Kansas. I found this collection of short stories to be quite good. The stories revolve around a central theme of memory and loss. The characters really come to life. Several of the stories are about characters with some form of dementia, and I found these very moving. In general, Anthony Doerr portrays older characters with vision and grace. My favorite stories were the title story, Memory Wall and Afterworld. An excellent reading experience. Deze recensie verscheen eerder op Bevlogen letteren.Het geheugen is een huls met tienduizend kamers.‘Waarom geloven we dat ons leven naar buiten leidt door de tijd? Hoe weten we dat we niet continu naar binnen reizen, naar onze kern?’ Schrijver Anthony Doerr (1973) heeft voor zijn werk goed nagedacht over een citaat van schrijver Aldous Huxley: ‘Ieders geheugen is zijn persoonlijke literatuur’. Maar wat gebeurt er als het geheugen je in de steek laat? Of wanneer je verplicht je dorp moet verlaten waar al jouw jeugdherinneringen liggen? En wat als je ternauwernood aan de Holocaust bent ontsnapt en deze herinneringen je op latere leeftijd blijven achtervolgen? In Een muur vol herinneringen: en andere verhalen (2017) speelt het geheugen de hoofdrol. In elk verhaal wordt deze thematiek op een andere manier verwerkt: van de kwetsbaarheid van herinneringen naar de manier waarop gebeurtenissen uit het verleden iemand juist kunnen versterken. De verhalen hebben echter ook iets met elkaar gemeen, namelijk dat in ieder verhaal herinneringen een verbinding maken tussen de personages en anderen. Hoewel verlies soms bij het leven hoort, kan het geheugen er dus juist weer voor zorgen dat iemand zich geliefd voelt.Anthony Doerr is geen onbekende schrijver. Hij heeft met zijn werk al veel literaire prijzen gewonnen, zoals de Pulitzer prijs voor fictie met zijn boek Als je het licht niet kunt zien (2015). Voor deze roman moest hij zich ook verdiepen in de werking van het geheugen. In een interview met Hebban vertelt Doerr dat hij voor zijn beschrijvingen over het verzet herinneringen uit dagboeken gebruikte. Hoe ga je daarmee om en op welke manier verwerk je deze herinneringen in een roman? Doerr was dus al bekend met de werking van herinneringen voordat hij aan zijn verhalenbundel Een muur vol herinneringen: en andere verhalen begon“Elk uur verdwijnt overal ter wereld een oneindig aantal herinneringen, hele schilderachtige atlassen worden mee het graf in gesleept. Maar gedurende datzelfde uur zijn kinderen in de weer, onderzoeken voor hen gloednieuw territorium. Ze duwen de duisternis weg; laten herinneringen achter de kruimels brood. De wereld wordt herschapen”.>De verhalen tonen dat Doerr veel tijd heeft besteed aan het ontwikkelen van een mooie schrijfstijl. Hij kiest de juiste woorden om de lezer te ontroeren en weet precies wanneer het tijd is om het tempo van het verhaal op te voeren. Niet elk verhaal in de bundel is van hetzelfde niveau, maar dat maakt niet uit want elk verhaal toont op een andere manier het belang van het geheugen voor ons leven. Daarnaast heeft Doerr het aangedurfd om realistische thema’s soms met een vleugje magie op te frissen. Neem bijvoorbeeld de ‘geheugenmachine’ die het vermogen heeft om verschillende tijden en plaatsen aan elkaar te verbinden met als resultaat een volledig beeld van het leven van sommige personages. Hoewel zo’n machine in realiteit niet bestaat, heeft Doerr het op zo’n toegankelijke manier beschreven dat de lezer er wel in gaat geloven.De verhalen in het boek laten een spoor achter. Terwijl het ene verhaal met een positieve noot wordt afgesloten, kant het volgende verhaal tot frustratie of zelfs verdriet leiden. Daarnaast heeft Doerr ervoor gekozen om open en gesloten eindes van verhalen met elkaar af te wisselen. Soms weet de lezer dus niet waar hij of zij aan toe is. Deze techniek heeft echter als resultaat dat je soms bijna wordt geforceerd om over de werking van het geheugen na te denken. Dit is naar alle waarschijnlijkheid ook het doel van Doerr geweest. Het geheugen is zo’n belangrijk deel van de mens omdat het ons de mogelijkheid geeft om op de betekenis van het leven te reflecteren.Een muur vol herinneringen: en andere verhalen is een boek vol mooie verhalen over de werking van het geheugen en de kracht van bepaalde herinneringen. Realistische thema’s zijn vermengd met mysterieuze aspecten en de grote vragen over het leven in de verhalen zetten iedereen aan het denken. Door de prachtige schrijfstijl van Doerr zullen de verhalen dus niet zomaar het geheugen van de lezers verlaten.Met dank aan Hebban voor dit recensie-exemplaar! *Received from Goodreads' First Reads program*In its short existence, there have been many masters of the short story. Flannery O'Connor. Anton Chekhov. Raymond Carver. Jorge Luis Borges. Some of them were writers of larger works, but we tend to remember them best for their short pieces. Ambrose Bierce. Stephen Crane. Zora Neale Hurston. Eudora Welty. John Cheever. Many of these writers belonged to a different era, a time when short stories were appreciated, even revered. Guy de Maupassant. Edgar Allan Poe. O. Henry. But some have continued to captivate our interests in recent years. Alice Munro. Amy Hempel. Anthony Doerr.Is it perhaps a bit premature to add Anthony Doerr's name to this list of greats? Perhaps. But I have little doubt that given a little perseverance by the author, and time, Doerr will be one of those writers we think of when we consider the short story. He is a true talent, with writing that is natural and a voice that is rich.Each story in Memory Wall is unique. Doerr is able to transport the reader from a semi-dystopian South Africa to an aquarium in 1914 Detroit without a hiccup in skill. Along the way, the reader visits contemporary China, a magical, yet dilapidated village in Lithuania, WWII era Germany, as well as Wyoming and Korea. No matter the setting, it is as if Doerr has entered his story and walked around in it, observing every important detail. He has such a great sense of space that the settings come to life.Fortunately, Doerr's talent does not end with place. His stories and characters are just as vibrant as the worlds they are dropped into. Every one of these stories is tangible, empathetic, and moving—almost literally moving; often it felt as though the page had a rhythm, in and out, swaying gently in the fabric of the author's carefully woven tales.Anthony Doerr's Memory Wall is nearly a perfect collection. It is a real spectacle and well worth the time it takes to read, not just once, but over and again.Favorites: “Procreate, Generate”, “Afterworld”, “Memory Wall”, “The Deep”Note: The paperback edition includes a seventh story not included in the original publication. While in many short story collections, stories that are added in later editions are often “throw aways”, this is not the case with this one. “The Deep” is wonderful and worth owning. It felt as if it belonged in this collection; it was just a little late showing up. This collection of short stories revolving around the themes of memory and how past experiences can both figuratively, and throughout the book even literally, be as tangible and at times more real than the world we inhabit today, is a breath of fresh air. Despite the protracted format, the author effortlessly packs each story with layers of complex characterization and beautiful narrative providing as much content and impact than most books twice the size. In the limited pages he works with, Doerr creates believable sincerity into each character’s back-story and in such subtle nuances, that he invokes genuine sympathy rather than feeling he's manipulating the reader into caring for what happens to them. In the title story, he moves seamlessly from Alma’s sad deterioration from Alzheimer’s (and dependency on plastic memory cartridges to relive the happier experiences of her youth and retain her last bits of humanity), to the hardships of her loyal housekeeper/nurse, Pheko, in taking care of his sick son amid the squalor of the South African ghettos. Doerr's use of multiple points of view enhances the story’s progression rather than detracts, a device that would likely be mishandled in lesser hands. Although a couple of the other stories may fall flat compared to standouts such as Memory Wall, Aftermath, and The River Namua, this book is highly recommended and a great example of how the short story can match or even exceed what is considered only possible in the novel format. Wow. This book really knocked me out. 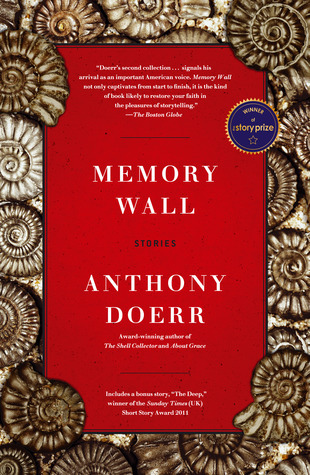 The six stories in Anthony Doerr's fantastic collection each deal with memory--what memories (and their loss) mean to us, how they move us and how conscious we are in the creation of new memories. (A character in the first story says "Remember a memory often enough and you can create a new memory, the memory of remembering. ")Each story has a wholly different premise and different main characters, and takes place in a completely difference place and time, from the lengthy opening story about a town in South Africa where doctors have developed a procedure to harvest memories from those suffering from dementia in the hopes of rebuilding some of the brain's connections, to the concluding story about a dying woman struggling with early memories of growing up in Nazi Germany. And each has its own power—some hit you between the eyes while some slowly build in your mind. This is a tremendously well-written book that really has me thinking about my own memories. Doerr has done a fantastic job, and I can honestly say this is one of the best books I've read all year. Oh I liked these six short stories much better than Doerr's Pultizer Prize winning All the Light We Cannot See. There are only six stories and the first - Memory Wall - is more than a third of the book. They are set all over the world and are set in real times and in future times. There is, I think, a bit of science fiction and mystical elements mixed in some of the stories. While I thought the first story was excellent, my favorite was the last story - Afterworld - which concerned an 80 year old woman remembering her childhood friends and wondering why she was allowed to escape their fate -- Birkenau. My second favorite was the fifth story - The River Nemuas - in which a young girl struggles with live without her parents, both of whom died of cancer within 6 months. She is now living with her grandfather in Lithuania. In each of the six stories, memory is the main topic. Doerr presents the topic in a variety of situation - memory as comfort, memory as sadness, memory as guilt. Disappointed in this book, and it came so highly recommended! :) I do have to say that his writing style is nice, I enjoy the simplicity and also the depth with his careful word choice. For my tastes, the style is slightly too abrubt, but just as I said, that is just my taste. He did a good job at making these characters come alive and without actually saying but showing exactly what they feel. I was disappointed though with the lack of direction that the stories seem to take. The only direction seems to be revealing more about the lives of these people (which is done well) but I keep finding myself asking, "Whats the point?" I get the theme of memories, but I don't feel he's saying anything new that I didn't know before opening the book. I feel he's taken an in depth look at these character's lives, but not into memories. That being the case, I would rather have some conclusion of their lives and struggles we experience with them than leaving all the strings untied at the end. (Some individual stories, like the title story, 5 stars)I am not a big fan of short stories (I prefer novels because I like to have the time to really get emotionally invested in characters) but I have been trying to give more short story collections a try since You Are Not a Stranger Here showed me just how potent they can be in the right author's hands. This is my first Anthony Doerr book, and after reading his brilliant story collection I am glad to have two more of his books waiting on my shelves. While I didn't connect emotionally with every story, I can absolutely see why he has earned so much acclaim. All the Light We Cannot Seeis the book I am most excited to read on my to-read shelf (it's the one I'm saving for a reading slump, or when I just really need to fall in love with a book to distract me from everyday life). enjoyable short stories looking at human life and memories through different eyes, places and culture. the author takes us a journey through the lifes of a dementia sufferer, a jewish girl growing up in Nazi Germany and in latter life in the USA. an orphan who travels to eastern Europe and begins life again with relatives and at the heart of the stories is how humans can adapt and his uses lovely prose and you feel for some of the characters. This book is filled with memorable characters, images and prose. It will make you happy and sad, occasionally both at the same time. It's clear the author cares a lot about everything and everyone, even animals. Despite the fact that it took me an obscene amount of time to finish, I really did love this collection. Each story painted its own unique, richly detailed world that seemed both very far away and very close at the same time, each subtly linked to the overarching theme of memory. Anthony Doerr is a writer to treasure. I was captivated by All the Light We Cannot See, and very sad to have that book end. It took him 10 years to write that wonderful novel, so I'm not optimistic that there will be another new book on the horizon soon.So I decided to buy a copy of his previous short story collection, Memory Wall. I'm so glad I did. These stories held me spellbound by the remarkable settings, vivid descriptive writing, the depth of his imagination and empathy, and the way he slowly reveals his characters' inner worlds.A thread of memory runs throughout the book linking stories set all over the globe, from South Africa to Wyoming, from the DMZ in Korea to a village in China about to be swept into oblivion by the Three Gorges Dam, from an American teen in Lithuania to an old woman remembering her childhood in WW II Germany (and a bonus story set in Depression era Detroit.) I didn't want these stories to end either.If you're already an Anthony Doerr fan, you won't want to miss Memory Wall. If you haven't read him yet, you have a treat in store for you when you pick up this book.